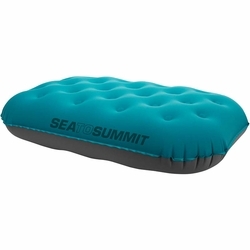 Sea to Summit Aeros Ultralight Deluxe Pillow. The Aeros Ultralight pillow has been refined from three ideas: light, compact, and comfortable. The result is a 20 denier pillow with shapely support that can be packed away into a neat, small stuff sack. From the airplane to the mountains the Aeros Ultralight is the perfect travel companion for those on the move.